Jim Gavin has introduced a number of his key men for today’s last four clash. GALWAY BOSS KEVIN Walsh has made one change for today’s All-Ireland SFC semi-final against Dublin. Patrick Sweeney replaces Adrian Varley in the Tribe attack in their only switch from last weekend’s loss to Monaghan. Dublin have made nine changes from their victory over Roscommon in the Super 8s last weekend. Jonny Cooper, James McCarthy, Brian Fenton, Ciaran Kilkenny, Niall Scully, Brian Howard, Con O’Callaghan, Dean Rock and Paul Mannion all come into the team after being rested for the dead rubber game. Bernard Brogan hasn’t made the 26-man squad while John Small has been named on the Dublin bench and Michael Daly is held in reserve for Galway. Email “Nine changes for Dublin while Galway make just one ahead of crunch All-Ireland semi-final”. 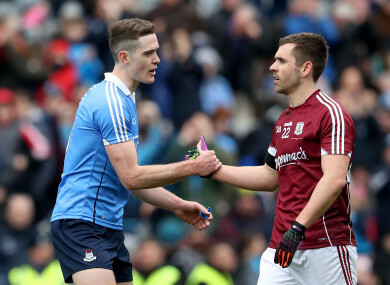 Feedback on “Nine changes for Dublin while Galway make just one ahead of crunch All-Ireland semi-final”.